The other night, my mom and I were buddies in the kitchen and whipped up a wonderful dinner. The idea and inspiration came together quickly and effortlessly, and we tag-teamed in the kitchen. Normally, my dad is around for dinner, but he went out to camp to spend the night. Jesse was supposed to have dinner with us, but ended up changing his plans. It was fine though … mom and I enjoyed our time together, as always. I threw together the summer squash caprese noodle salad from my copy of Diane Sanfilippo’s new book, Practical Paleo, and steamed some broccoli. My book actually just came in the mail that day (I had it shipped to my mom and dad’s) and I was excited to try something in it right away! Mom browned some chicken that she cut into tenders and then added a jar of her homemade marinara to it (I love my mom’s marinara sauce … it’s the best and so fresh). Before we knew it, dinner was ready and on the table. Everything paired so nicely together and tasted wonderful. We made sure to wear spaghetti bibs in case things got messy. After all, you never know with tomato sauce. Sometimes, you think you’ve been so careful, but then look down to find some red/orange splatters on your shirt, and that’s the pits. The bibs help prevent that, as they are big-kid size (aka adult). My dear Grandma Boboltz is to thank for the bibs. She made them for our family many years ago, probably with my dad and sister, Amanda specifically in mind (those two were always the ones to drop/spill/splatter food on themselves). As you’ll see below, my mom got my picture with one on, but she wouldn’t let me take her photo. I guess she didn’t want her face all over the internet or something, even though her photos are already on Facebook! Anyway, below is the recipe for the Practical Paleo, summer squash caprese noodle salad (Note – this book, which is much more than a cookbook is absolutely amazing, and I highly recommend it. The information, guidelines, and meal plans for specific ailments is outstanding!). 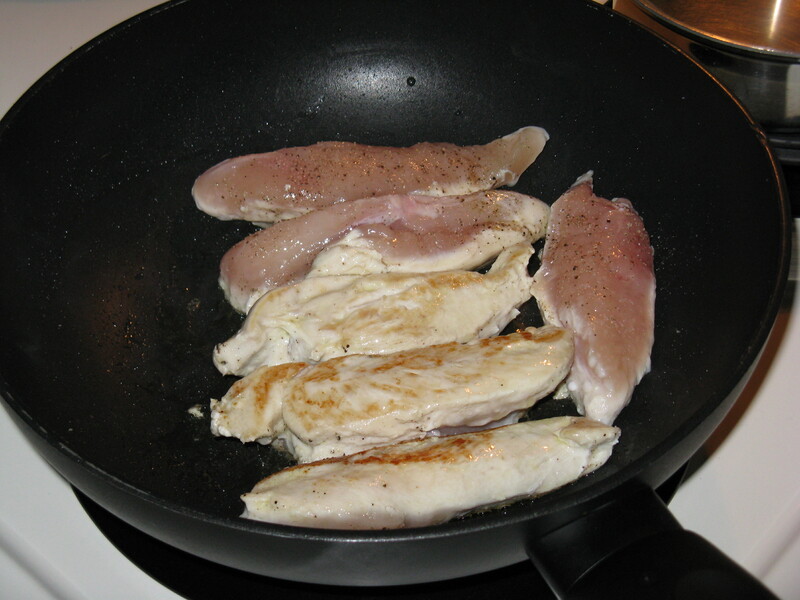 *Note – I also added some of my mom’s fresh oregano to the salad, which was a wonderful addition. Chop the ends off of the zucchini, and peel down to the center seedy section with a julienne vegetable peeler to make fettuccine-like noodles. (You can use a standard peeler if you don’t have a julienne peeler). Note – I cut the zucchini into thin strips with a knife instead because it worked better than the veggie peeler, and I didn’t have access to a julienne peeler. Combine the cherry tomatoes, basil, garlic, extra-virgin olive oil, sea salt and pepper in a medium-sized mixing bowl. Toss the squash with the tomato mixture, and place onto a flat dish or into a bowl to serve. 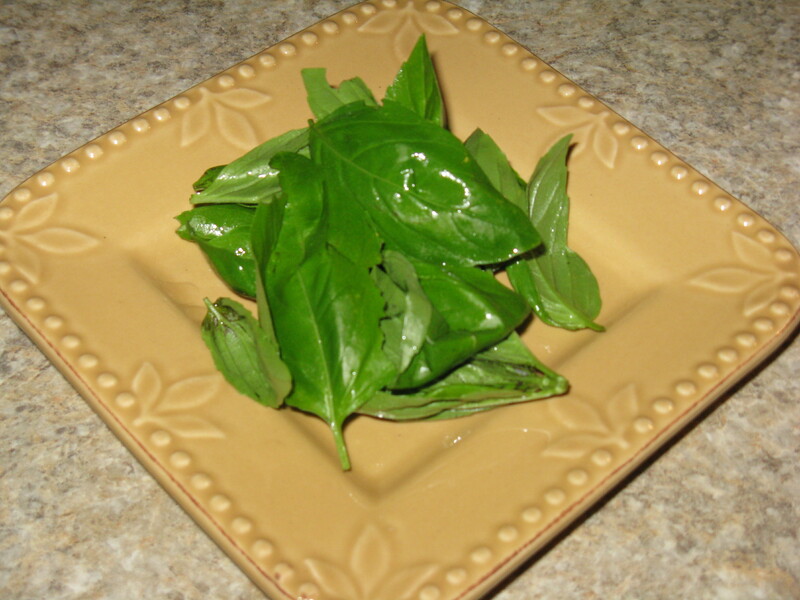 Fresh basil from my mom’s basil plant. 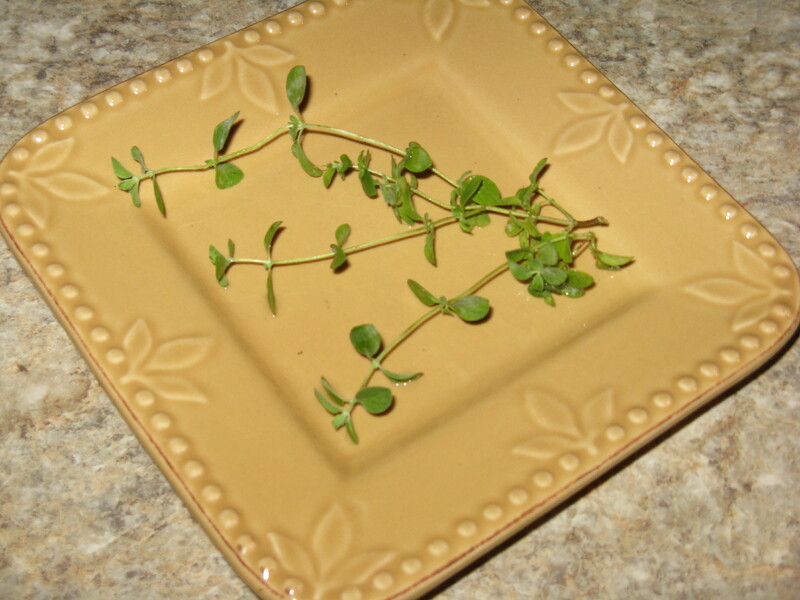 I also added some of my mom’s fresh oregano to the salad. 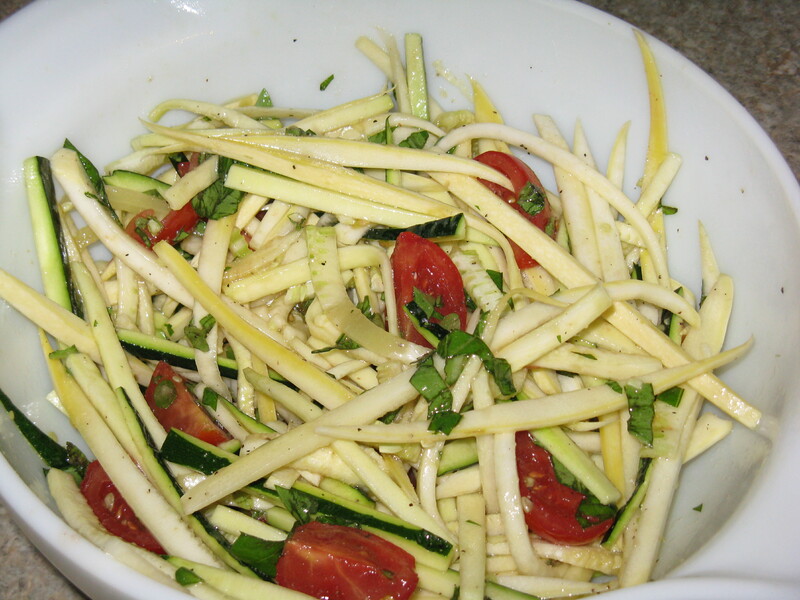 Summer squash caprese noodle salad. Colorful, fresh, easy and delicious! Mom tended to the chicken. 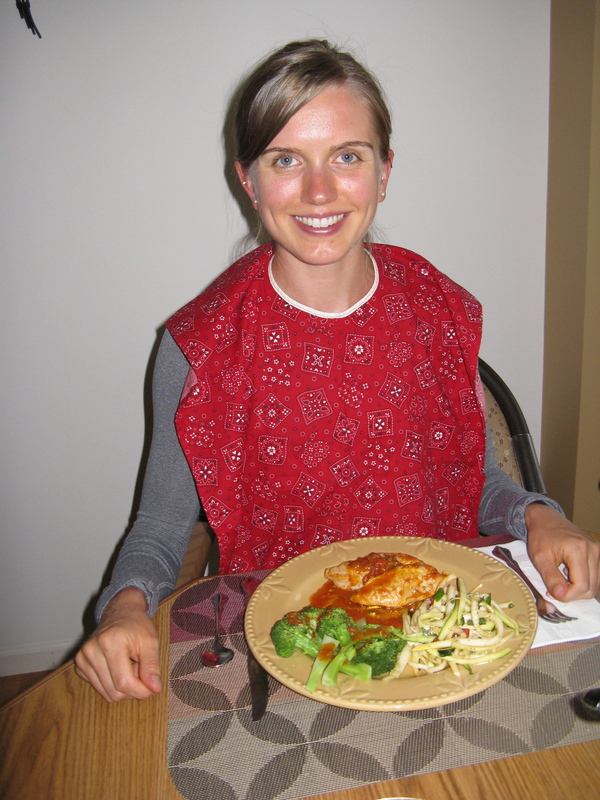 Me with my handy dandy bib and plateful of food. Don’t mind the sheen to my face … I still hadn’t showered after a sweaty workout with Jesse at the gym, which was actually many hours prior! As you can see, I got a little sun on my face too. That recipe looks wonderful! And I love the bib haha. It’s cute! Haha, thanks! You can’t go wrong with the bibs. I actually need to get some of my own! This post makes me miss my momma! What a great getaway from everyday life! Enjoy yourself. Thanks, Theresa! It’s been great so far and it’s wonderful to spend time with my family back home. I feel very blessed.